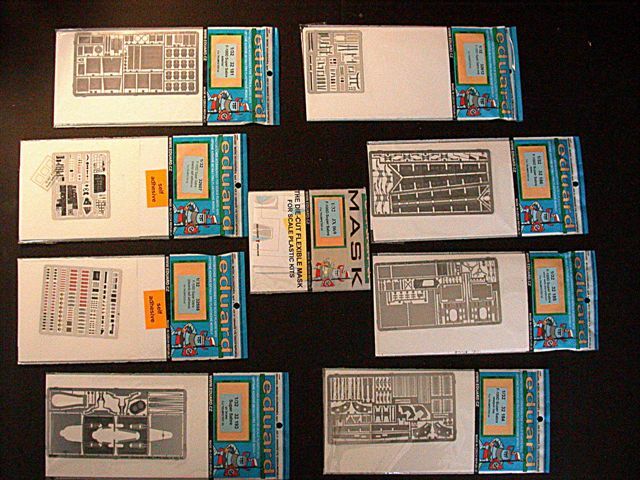 Conclusion: Least amount of work for "bang for the buck"
PROS: The combo price, ease of application and appearance of Color-Etch instrument panels, consoles and seatbelts. Review samples courtesy of Eduard. Although genial Jef Verswyvel at Avionix (Black Box) is almost always first outta the chute in producing aftermarket resin cockpit sets for newly released kits, one can usually assume that the Czech Republic elves at Aires will be along bye and bye with their excellent aftermarket products, in this case separate cockpit and wheel bay sets for the big Trumpeter Hun. Aires combines PE belts and instrument panel (film instrument backing) with a resin tub, seat, canopy frame, gunsight/HUD and rear shelf. 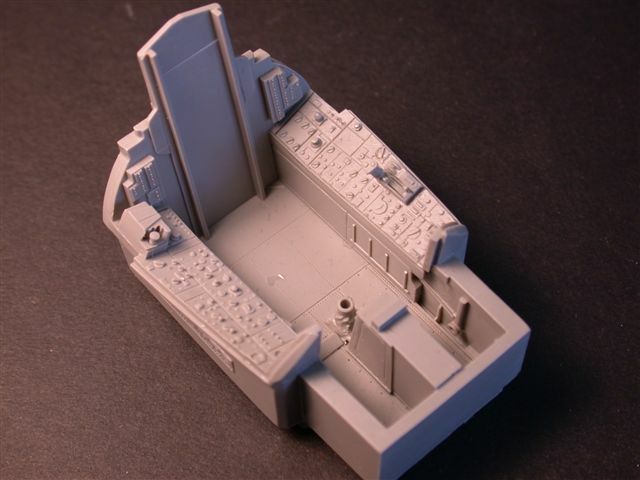 The Aires seat, unlike that of Avionix’ offering, is minus the chute, which is how Huns were usually configured. That is, pilots carried their chutes back and forth to the airplane from the personal equipment section of their squadrons. 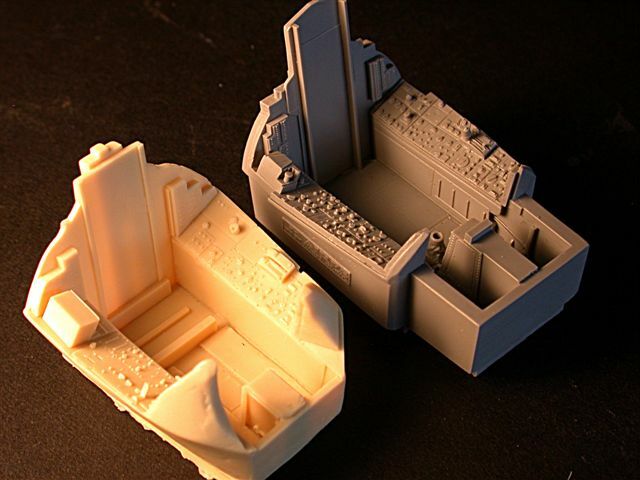 Compared with Avionix, molding quality of the Aires cockpit components is IMO slightly sharper and more detailed, especially in the side consoles and sidewalls. 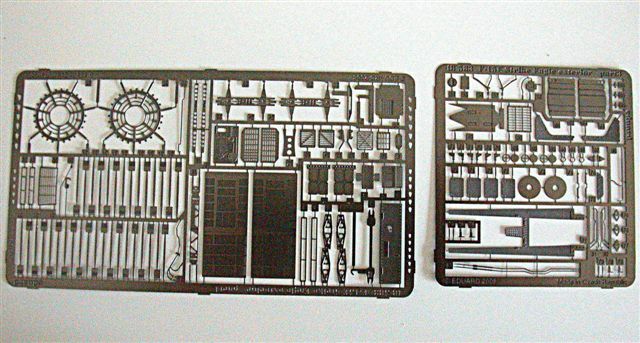 And then there’s the very nice one-piece canopy frame, not included with the Avionix set. 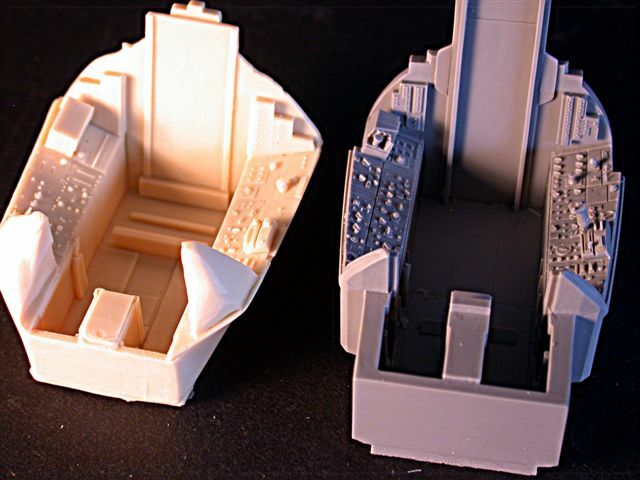 Unfortunately, the Aires PE instrument panel and seatbelts are not pre-painted, which adds more labor, whereas the Avionix seat has a molded instrument panel, and a wealth of belts and harnesses molded in, although of course they need painting too. It’s a tossup. Third and fourth choices would be to either combine the nice Eduard Color-Etch belts with the Aires seat or to use the nice “chute-less “ resin seat (belts, hoses molded in) done by Harold Offield. 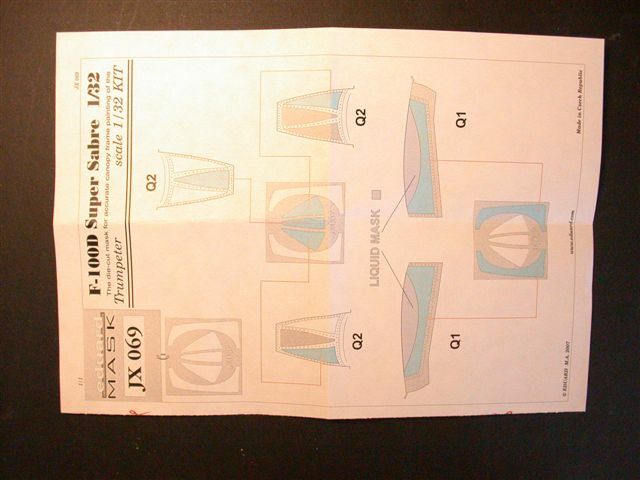 To give the modeler a sense of the differences between the Aires and Avionix sets, as well as the individual seat by Harold Offield. I’ve lined ‘em up: the grey components are Aires (exception: the darker gray seat in the middle, with cast-in belts, is Harold’s seat) and the buff pieces are, of course, Avionix. 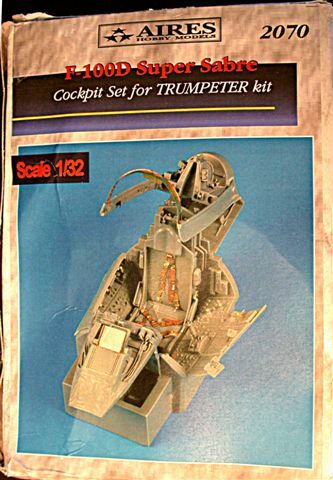 PROS: Well detailed, plus one-piece canopy frame. 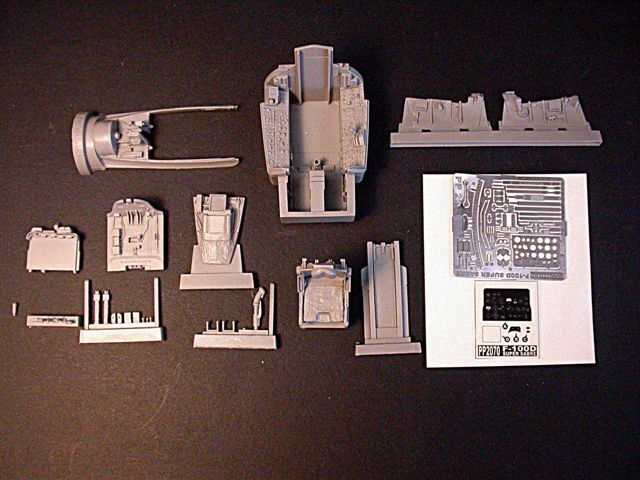 CONS: Relatively high price, unpainted PE components. Review sample courtesy of Aires. 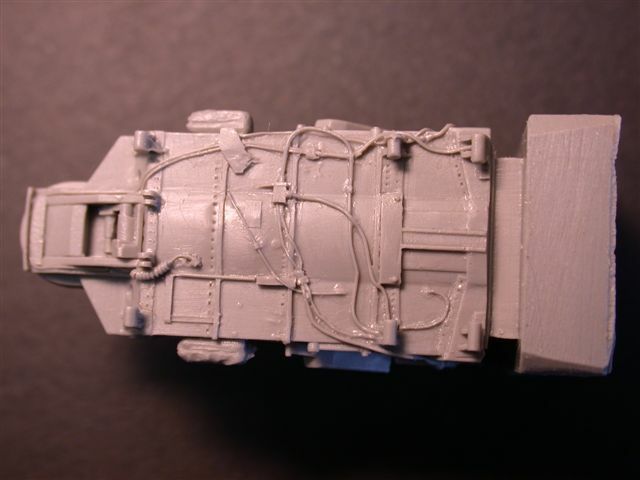 The “Plain Jane” Trumpeter nosegear and maingear wheel bays cry out for detailing; when the modeler holds the very “busy” Aires wheel bays next to the injected versions there’s absolutely no contest; you need this set! 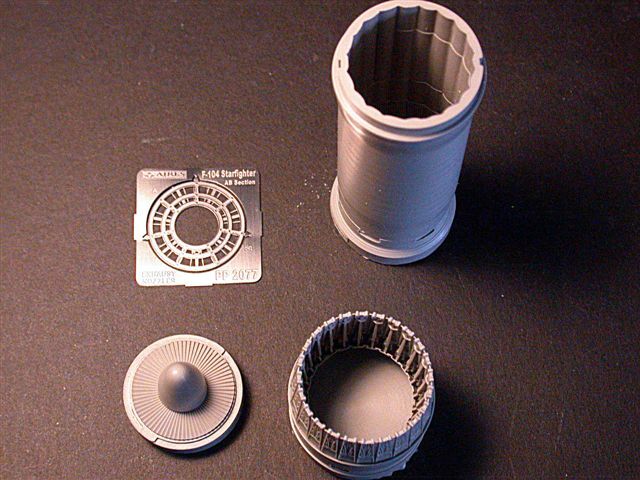 The portion of the maingear bays that mount in the wings and enclose the struts unfortunately have the same troubling installation problem as some other shallow wheel well aftermarket offerings. That is, to have even a prayer of slipping the resin wells into the space between the upper and lower wing halves, one must sand the bottoms (upper, flat side) of the wells to a paper-like thinness; I had to sand the other sides as well! The nosegear bay gets new, nicely detailed doors (two) and there are a number of small hydraulic actuators (hydraulic lines molded in) and various tubes to add. PROS: Very minutely detailed; adds much realism. CONS: Maingear strut wells require significant-but-delicate sanding prep. 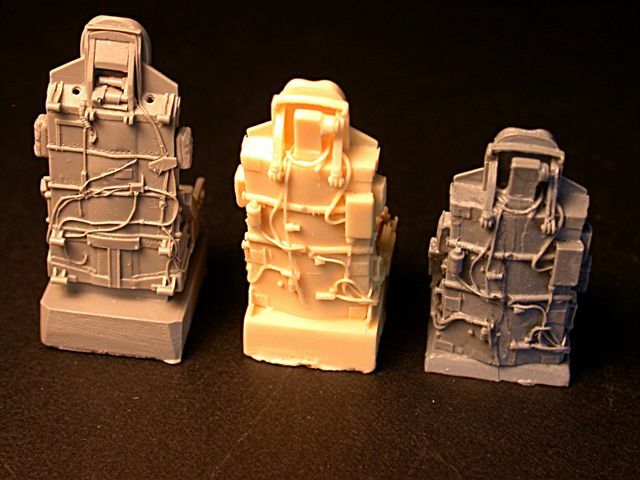 This four-piece resin and PE set is a definite step up from the now middle-aged (but nice!) 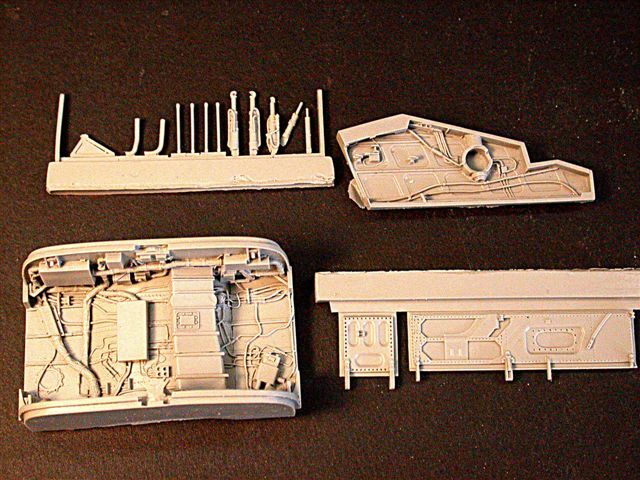 Hasegawa kit. 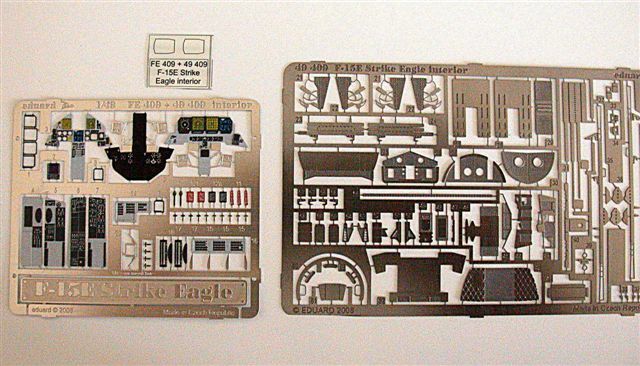 I went out to the Bondo Industries Kit Repository and compared the corresponding components in the original offering with these new embellishments by Aires master modelers. Improvements are very noticeable, especially with the variable exhaust “petals”. 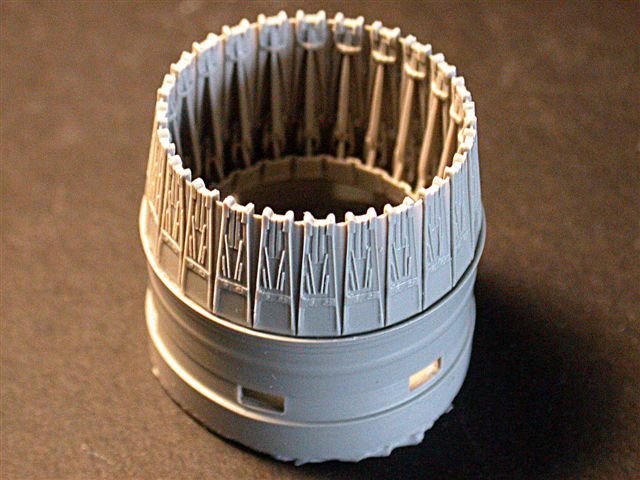 The afterburner flameholder is done in PE which produces a much finer, delicate look than the clunkier Hasegawa injected part. 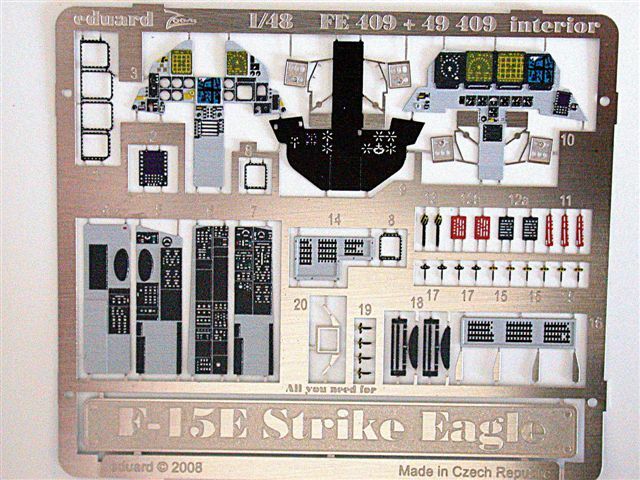 The first thing I noticed about the five F-15E PE sets recently released by Eduard is that the sets are ostensibly for the 1/48 Academy kit. Strange, I thought, because it’s been a long time since I’ve seen one of these kits on the shelf, or even at a vendor’s table. 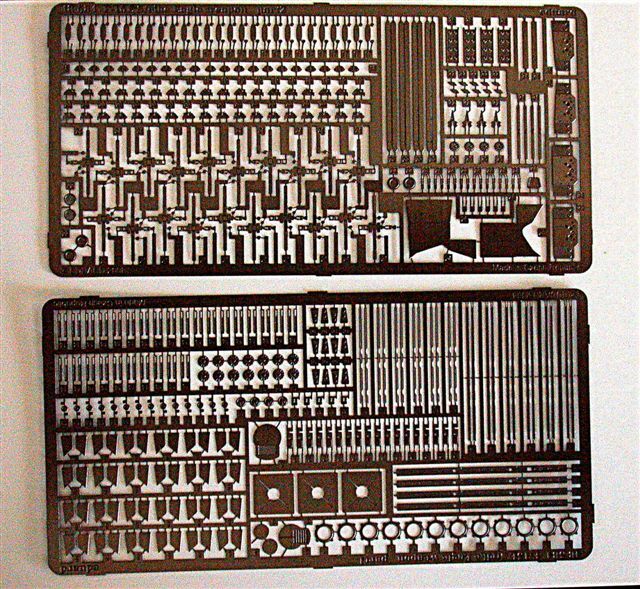 What I do currently see on hobby shop shelves and at vendor tables is the IMO definitive 1/48 kit of this notable air-to-mud machine, that is, the Monogram Pro-Modeler release. 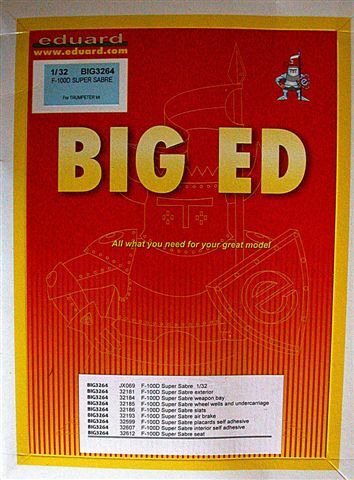 When I wondered out loud why, at this late date, Eduard would use the(nowadays) little-seen Academy offering as a subject for a substantial amount of PE, one of the very knowledgeable staff members at King’s Hobbies remarked that this wouldn’t be the first time that Eduard had mis-printed an incorrect subject kit on a package of PE! 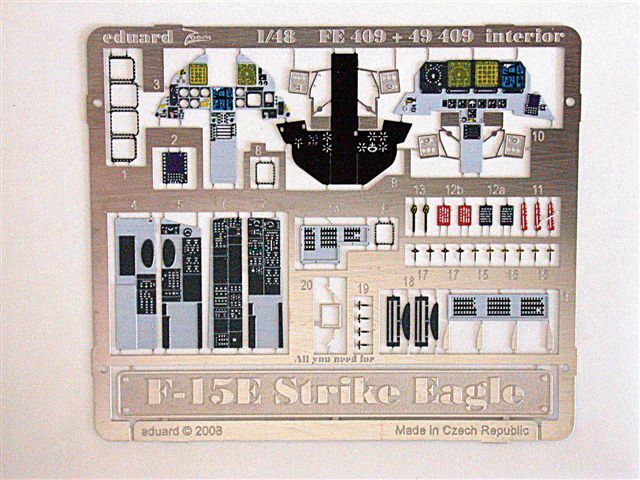 In any event it seems very late in the game–both F-15E kits have been on the market for years–to attempt to overcome the efforts of various resin aftermarket manufacturers (I’ll make an exception for Color-Etch components!) who came out with offerings quickly following the kit releases. 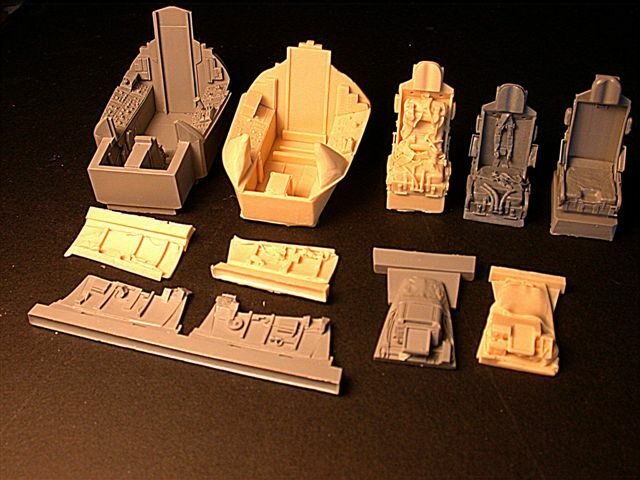 Color-Etch interior sets are where, IMO, Eduard really comes into its own. 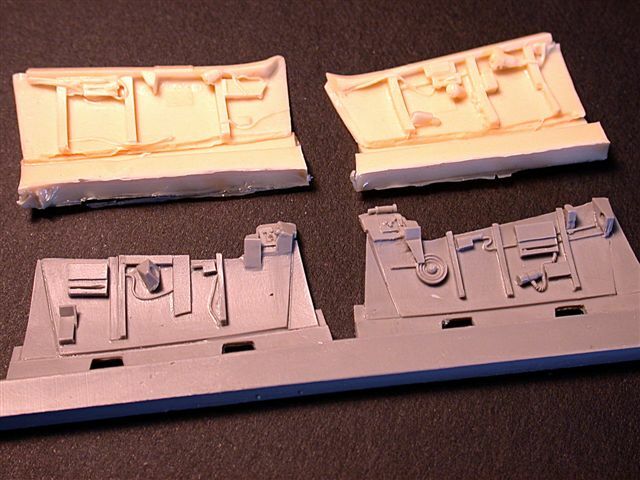 It’s very difficult to handpaint 1/48 and 1/72 instrument panels and consoles--this curmudgeon’s done many--to look as good as the overall effect of the multilayered Eduard panels. The fact that there is little, if any, vertical development, as opposed to resin sets is IMO of little consequence in the smaller scales. 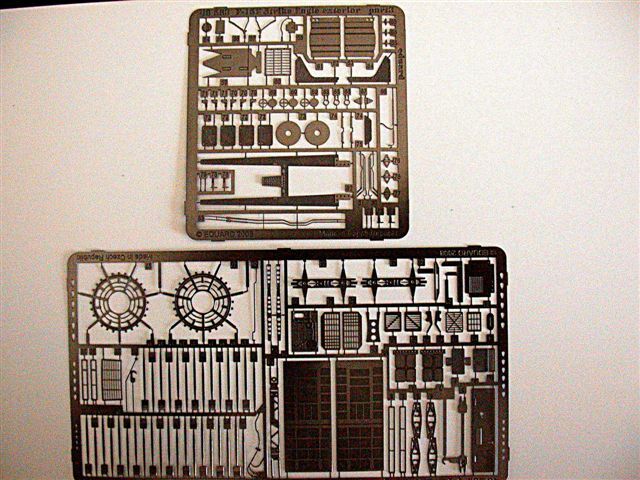 I took a close look at the Pro-Modeler cockpit panels, and it appears that the Eduard sets will work with little or no modifications. This small fret adds petite details to the kit seats rather than building totally new assemblies. 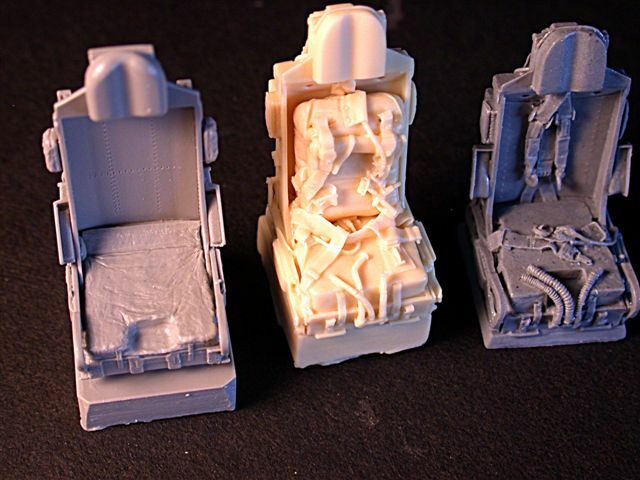 Other than the nice Color-Etch belts and harnesses, it seems to me that, in light of the labor in assembling and glueing many tiny PE parts, the modeler is probably further ahead by using a high quality resin seat. 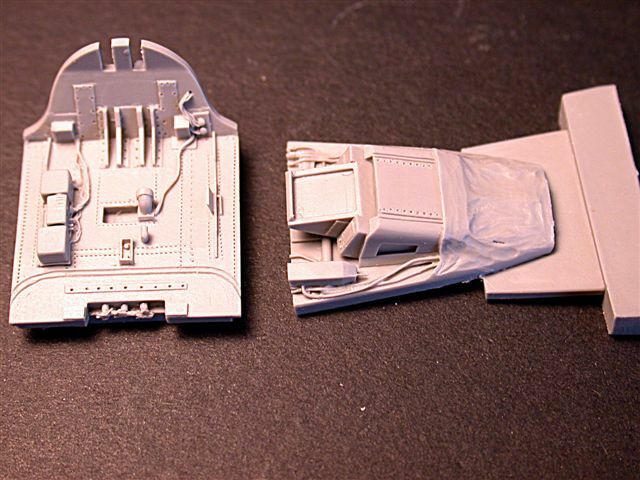 CONS: Lots of tiny parts to assemble and glue; going to a resin seat will be less labor intensive. Two large frets contain so many tiny components that modelers successfully completing the installation of same can skip their neurosugery residencies and go straight into practice! 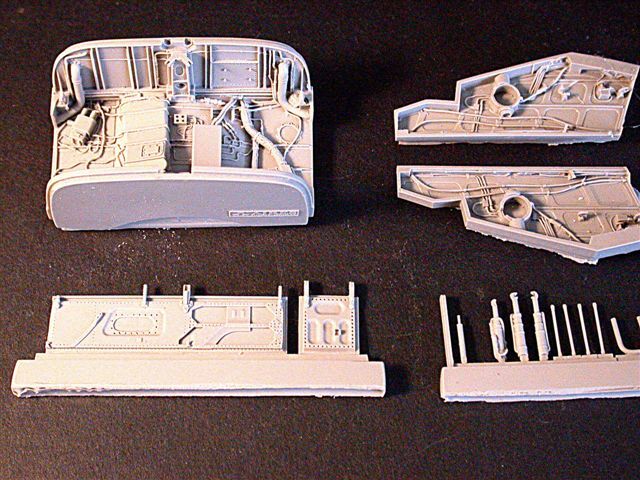 :) Some of the operations such as sanding off tiny AIM-9 guidance fins and adding new PE ones make me wonder if there’s that much of a benefit to be realized given the labor required. The name of the game in aftermarket is to pick and choose what portions of which offering will give the biggest visual “bang” for the buck, and with the least amount of labor. 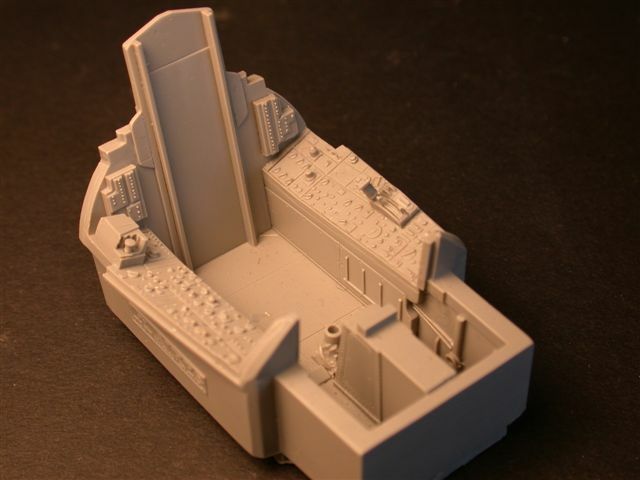 I personally like to combine Eduard Color-Etch instrument panels and consoles with resin cockpit sets (or even the stock kit parts), even if it means I have to grind off the admittedly very nice resin instruments. 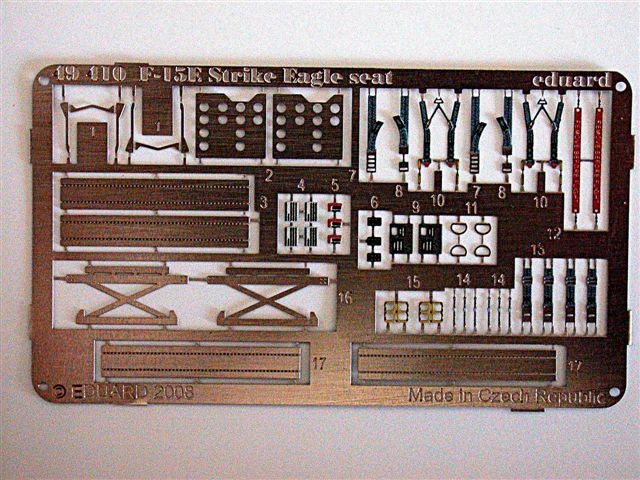 Oh, and I’d appreciate it if Eduard would verify that these latter sets were really meant for the Academy F-15E and not the Pro-Modeler release.